Early neo-Gothic borrowed elements from Gothic for decorative use without any understanding of the ideas behind them. Neo-Gothic on the other hand actually tried to understand the basic principles of Gothic, and used them; early neo-Gothic was still closely related to neo-Classicism both in general shape of the buildings as in the use of materials; usually only the shapes of the details differed. In early neo-Gothic churches the use of imitations of natural materials was standard practise, in neo-Gothic it was almost unacceptable. Early neo-Gothic usually shows a close relation to English Gothic styles, while neo-Gothic at first was strongly inspired by French and German Gothic examples, and by indigenous ones at a later stage. Early neo-Gothic churches were often plastered or painted, neo-Gothic churches were not. Many architects, such as C. Weber, H.J. van Tulder and Th. Molkenboer, took elements from both neo-Gothic styles and combined them for several decades, making the boundary between the two very thin eventually. In this second fase of early neo-Gothic, the three-aisled cruciform ground plan was more common, as well as real towers. Proportions however are often strange, while plaster was still used for ornaments and vaults. The Redemptorist church in Amsterdam (left) is often considered to be the first big church in true neo-Gothic style in the Netherlands. It was built from 1852 until 1854, and its design was made by Th. Molkenboer, who took the Redemptorist church in Mons (Belgium) as an example. Molkenboer was at that time the leading church-architect in the Netherlands. Although he was a typical representative of his generation, designing in the then fashionable styles of neo-Classicism and early neo-Gothic, this building definitely exceeds that latter style. Instead of just using some more or less authentic looking Gothic elements, here the architect actually had studied the medieval examples well enough to come up with a design that closely resembled them both in style and construction. It has three aisled, with a clerestorey at the top of the central one. However, Molkenboer and similar architects like H.J. van den Brink never reached the point of actual neo-Gothic, if only because of their continued use of plaster vaults. The Amsterdam claim can be disputed, though. Those that hailed Molkenboer's church when it was completed, like catholic writer and art critic J.A. Alberdingk Thijm, where mostly located in Amsterdam itself and were unaware of what happened in other parts of the country. In 1850, two year before work began on the Amsterdam church, German architect C. Weber enlarged the church of Panningen (L) in such a way that it resulted in a mostly neo-Gothic church. This would make Weber the first architect to build a church in a truly neo-Gothic style, not Molkenboer. However, Weber's church was a Stuffenhalle, a German type of hall-church not commonly associated with Gothic, while Molkenboer's church was a basilica with the right Gothic proportions. The first church Weber entirely designed himself, the church of Amstenrade, was built in 1852-1856 and is also a Stuffenhalle. It has a mostly Gothic construction but with plaster vaults and an early neo-Gothic ornament at the portal. Weber designed many more churches in neo-Gothic style but is mostly remember for a series of impressive neo-Romanogothic churches built in the 1890's. One of a few architects who successfully made the transition from early to rationalist neo-Gothic was H.J. van Tulder. His catholic St. Lucia in Mierlo (NB) from 1856-1858 shows elements of both styles. Although executed in unplastered brick most of the ornaments are typical for early neo-Gothic. An important moment in the development of neo-Gothic is the year 1853, when the hierarchy of the Roman Catholic church was fully restored in the Netherlands. This year formed the first highlight of a proces that had been going on for a few years already, and that eventually lead to full catholic emancipation. In that year the archdiocese of Utrecht was founded, which encompassed the province of that name, as well as the entire north-eastern quarter of the country. 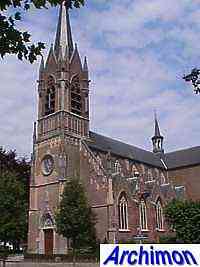 Besides, the dioceses of Haarlem, 's-Hertogenbosch, Roermond and Breda were formed. The catholics in the Netherlands now no longer were subject to catholic mission, but could stand on their own feet. In a spirit of newly found catholic self-confidence, many new churches, monasteries, convents and schools were built, and the neo-Gothic style was favored, in reference to the Middle Ages, when the Catholic church was still united and formed the back-bone of what was, at least in the eyes of the catholics, a perfect society. As neo-Gothic became the pre-eminent catholic style, churches in other styles were often quickly replaced. This goes for the churches in neo-Classical style, which was now regarded 'pagan', but also for many medieval churches which returned in catholic hands. Restorations often were carried out in neo-Gothic style as well. 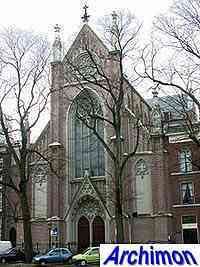 The historical importance of Molkenboer's church in Amsterdam, neo-Gothic though it is, must not be exaggerated. Of much more importance to the style are architects like C. Weber, who had studied the Gothic churches of his native Rhineland, Germany, and P.J.H. Cuypers, who had attended courses with French architect E. Viollet-le-Duc, internationally recognized as one of the leaders of neo-Gothic These two architects can be considered to be the true pioneers of neo-Gothic in the Netherlands. 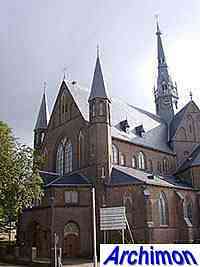 Another important architect is A. Tepe, who became the court-architect of the Utrecht archdiocese. Although there's no such thing as a true international neo-Gothic movement, many architects were in contact with each other. They shared their ideas and knowledge and learned from each other's work through various publications. Large projects, like the restoration and completion of the cathedrals in Cologne and Trondheim, had their impact in the Netherlands as well. Under the influence of E. Viollet-le-Duc and of Dutch artcritic and poet J.A. Alberdingk Thijm, one of the leaders in the movement for equal rights for catholics, Cuypers tried to fully understand the medieval Gothic principles before allowing himself to move on. This second period in his career started in ca. 1870, and Cuypers from that time combined new ideas with the Gothic principles. 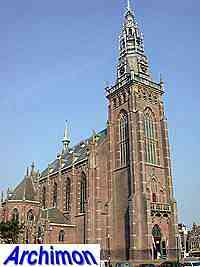 An important example is his Vondelkerk in Amsterdam, which combines German Gothic and Romanogothic influences with centralizing elements. A far cry from Cuypers' first works, like the St. Martinus in Maastricht (right). But Cuypers is one of only a very few architects who are willing to experiment. For A. Tepe Gothic is already the point of arrival, and his work shows little to no evolution. While Cuypers mostly takes his inspiration from early French (and to a lesser degree, German) Gothic, Tepe takes his from indigenous late-Gothic styles. Weber's work is inspired by both French and German Gothic, before moving towards a much more Romanogothic style. His neo-Gothic work is generally not regarded his best, and often shows a rather conservative approach to the style. Of these three architects Cuypers is definitely the most important, and he built churches in most parts of the country. A refusal to settle in Utrecht lead to a boycot in this archdiocese; only in those regions far from the episcopal city of Utrecht, like the provinces of Friesland and Groningen, did he manage to get some assignments. It's A. Tepe who is the favoured architect of the archdiocese. This architect on the other hand gets relatively few assignments outside this territory. C. Weber starts his career in the province of Limburg (the diocese of Roermond), where he is Cuypers' greatest rival, but eventually concentrates his attention on the diocese of 's-Hertogenbosch. In the diocese of Breda P.J. van Genk (1844-1919) became the most important architect for new churches, which in most cases show a clear influence from Belgian neo-Gothic, probably the result of Van Genk's education in Antwerpen, with a prominent use of natural stone combined with brick. Most of the other assigments were taken by former students of Cuypers. The most important of these are E.J. Margry (1841-1891), J. Kayser (1842-1917), N. Molenaar (1850-1930), C. Franssen (1860-1932), W. te Riele (1867-1937) and J.H.H. van Groenendael (1868-1942), who were all responsible for some important but often conservatively styled neo-Gothic churches. Kayser is probably the most original because of his use of elements of North-German brick Gothic, while some of Van Groenendael's designs are among the very best examples of the style. Te Riele is one of a few architects who managed to combine a neo-Gothic style with modern ideas about architecture. He designed several centralized churches. While protestants had built churches in the early neo-Gothic style, after 1853 they quickly looked for other styles. Only a very few examples of protestant churches in neo-Gothic style have ever been built since. One of these is the reformed church of Schagen (NH), designed by J.A.G. van der Steur and built in 1895-1897, but even this example is built in a style very different from catholic churches of that time. Gothic influences continued to be used, but usually in combination with other styles. Until ca. 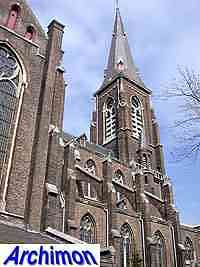 1914 neo-Gothic remained the dominant style for catholic churches. By that time however it had received some serious competition from other styles. While neo-RomanoGothic, with C. Weber as the most prominent architect, is of a very limited importance only, the neo-Romanesque style did reach considerable popularity. Especially some other students of Cuypers, like his son Jos. Cuypers and Jan Stuyt, were co-responsible for new developments in style, and were among the first to break the neo-Gothic monopoly. Buildings in neo-Gothic style were built for several more decades. By that time the style had lost most of its original character, and was mostly favoured by older architects. The O.L. Vrouwe Onbevlekte Ontvangenis in Hilversum is an example of a late neo-Gothic church; the traditional ideas of neo-Gothic had been abandoned, and the style is mixed with more modern influences, most notably a centralized ground-plan. It was designed by W. te Riele Gzn. and built in 1910.